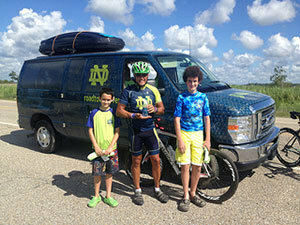 The “Road to Discovery” bicycle ride has raised awareness and more than $400,000 in funding for research and a clinical trial to treat children with Niemann-Pick Type C (NPC) disease, a rare, fatal cholesterol-storage disorder that took the lives of three grandchildren of legendary Notre Dame football coach Ara Parseghian. Little was known about the disease when the Parseghian children were diagnosed in the 1990s, but investigations by scientists around the world have yielded scientific breakthroughs in recent years. At the conference this weekend, researchers from the National Institutes of Health, Tulane University, Albert Einstein College of Medicine, Washington and Lee University and the University of Notre Dame will join representatives from the Food and Drug Administration and pharmaceutical corporations to discuss possible treatments for patients with Niemann-Pick disease. The Ara Parseghian Medical Research Foundation and the Charles Edison Fund have partnered with the University of Notre Dame to finance research to find treatments for NPC disease. With their funding, a group of Notre Dame researchers and their collaborators were able to identify novel medications that have shown promising results in treating NPC disease cells in the laboratory. Over the past four summers, Crawford has bicycled a total of 11,226 miles across the nation. He says, “My constant inspiration is the children and families who are suffering from this disease.” In his daily blog, he has written about many of the families who have inspired him throughout his journey and challenged him to never stop until a cure is found for the devastating disease. Originally published by Marissa Gebhard at news.nd.edu on August 02, 2013.